UNP MP Ravi Karunanayake today said a handful of people who opposed his appointment as the Assistant Leader of the party is something which has no significance. “Only one or two persons have opposed my appointment as the Assistant Leader. 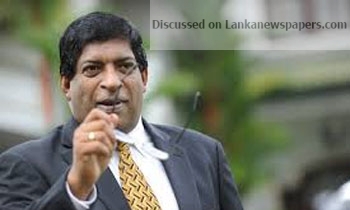 Therefore, it is not worth making any comment on it,” Mr. Karunanayake told the Daily Mirror especially reacting to former Minister Joseph Michael Perera who resigned from the UNP working committee opposing the party’s decision to appoint Mr. Karunanayake to the Assistant Leader’s post. “This is nothing but personal rivalries,” he added.